David Kelly, Justin Tonra and Lindsay Ann Reid at the Moore Institute, NUI Galway — July 2016. 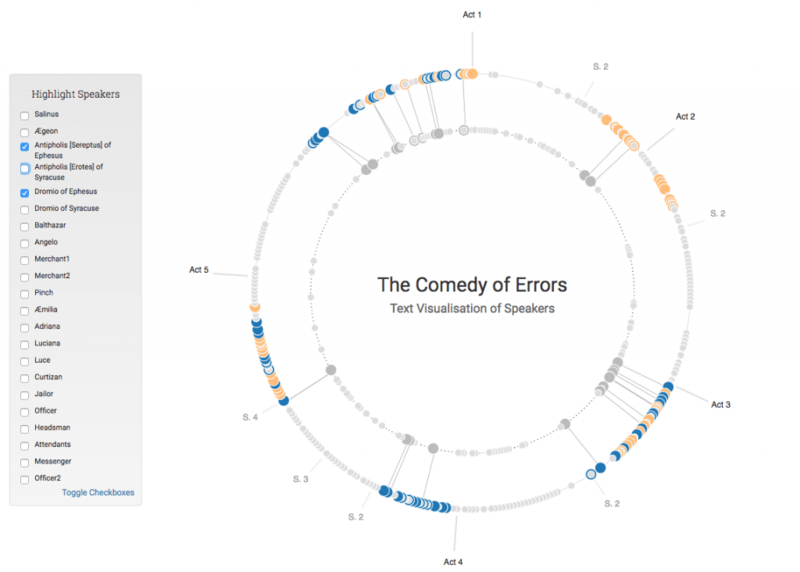 The aim of these visualisations is to use the XML files from the New Variorum Shakespeare edition of The Comedy of Errors to create a resource for exploring patterns of speeches by and mentions of characters in Shakespeare’s work. Visualising the frequency, extent, and position of dialogue relating to a particular character presents users with a simple and immediate measure of that character’s prominence within the play. The tool enables users to select and visualise individual characters’ involvement, producing a novel means of exploring large-scale structural, narrative, or character-focused patterns within the text. This tool is intended to facilitate character-based analysis and reveal structural patterns at the scale of the play. It is primarily exploratory, and is designed to allow users to customise the visualisation according to their particular interests or to follow a more speculative and disinterested reading of the play’s character-based features. This deliberate aim emerged from the heuristic development process described below, and a desire to produce an extensible exploratory tool for dramatic texts. From an initial focus on using digital tools to visualise the tangling and disentangling of character names and identities in The Comedy of Errors, our interest broadened into exploring the potential for using character data to visualise larger structural and narrative patterns. We were also motivated by the use of network analysis and visualisation for Shakespearean scholarship, including work by Grandjean, Moretti, and Stiller, et al. These analyses are similarly character-based and have yielded many interesting insights. But in the reduction of the textual data to nodes and edges (characters and their interactions), network analysis has obscured the temporal. By preserving characters’ locations within the space of the text, this tool enables analysis of the dramatic time and structural duration of the play. Moreover, a major part of the tool’s value is its extensibility. It may be used to create character visualisations for any play which is XML-encoded according to quite minimal specifications, and offer the opportunity to undertake comparative analysis of structural, narrative, and character-based patterns in different plays. As a point of contrast, we have generated a second visualisation for The Winter’s Tale from the code initially developed for The Comedy of Errors.